Huey Vineyard Twin Sleigh Bed is louis Philippe styling.Trendy replicated black paint. Shapely top moldings on the case pieces. Antiqued pewter color metal hardware complementing the Louis style. Side roller glide drawer system for smooth operating drawers. 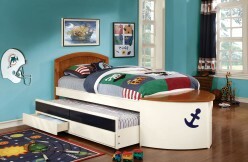 Curvaceous footboard panel caped with an elegant sleigh rail. 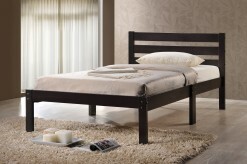 Furniture Nation is proud to offer the Huey Vineyard Twin Sleigh Bed online. We serve customers across the DFW region including Weatherford, Richardson, Denton and many more. Huey Vineyard Twin Sleigh Bed : L41" x D85" x H45"